Patricia A. 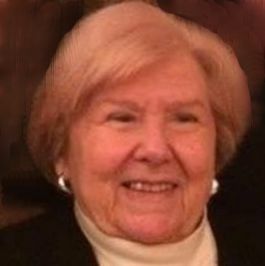 (O'Connor) Reynolds, 81, a long time resident of Georgetown, passed away peacefully Thursday morning, February 7, 2019 at Beverly Hospital surrounded by her family. Patricia was born on November 16, 1937 in Winchester, MA to the late Joseph and Edna (Austin) O'Connor. Patricia was raised in Arlington, MA and graduated from both Matignon High School and Regis College, where she earned her degree in education. Throughout that time, Pat developed many strong friendships that would last a lifetime. This close knit group of friends, affectionately known as "Club”, was very special to Pat, and the group of friends remained close and saw each other as much as possible throughout the years. Pat began a career in teaching and enjoyed summers on the cape, where she met the love of her life, John (Jack) Reynolds, also of Arlington. They married on August 4, 1962 and lived briefly in Portsmouth, RI and Arlington, MA before eventually settling in Georgetown in 1968 where they raised their six children. Pat was a devoted full time mother who was involved in her kids lives. For years she would be seen at scout meetings, school events, and on the fields cheering her kids on. During her spare time, Pat spent her summers on the Cape in Dennis building memories with her family. As her children grew up, Pat returned to teaching. She was a dedicated and highly regarded special education teacher in the Georgetown School System until her retirement. Patricia loved her students, and she was loved by them as well as the other teachers in town. While in retirement, Pat enjoyed going out with friends and family and spending time with her grandchildren. Patricia was the beloved wife of the late, John T. Reynolds, Sr. and is survived by their children, John T. Reynolds, Jr. and his wife Patricia of Georgetown, David Reynolds of Chicago, IL, Pamela Duquette and her husband Marc of Pelham, NH, Joanne Roy and her husband Marc of Goffstown, NH, Carolyn Bellefeuille and her husband Todd of Georgetown and Leslie Morris and her husband Paul of Hopedale. Her Grandchildren, Catherine Paluzzi, Christopher Roy, Ryan, Scott and Jason Bellefeuille, Kerry and John Reynolds and Jared and Derek Morris as well as her siblings, Maureen Fitzgerald and her husband Bill of FL and NH and Joseph O'Connor and his wife Nancy of FL. Pat is also survived by her sister-in-law, Sarah Crissey of Westford. Pat was predeceased by her brother, Robert O'Connor.